Last Updated: November 16, 2018 · Published: May 14, 2018 By: Asian Caucasian 2 Comments This post may contain affiliate links or sponsored content. One of my favorite (and quickest) soups that I make is chicken tortilla soup. Been making it for decades! So I thought to myself, why not make an Asian-fusion version of this classic? 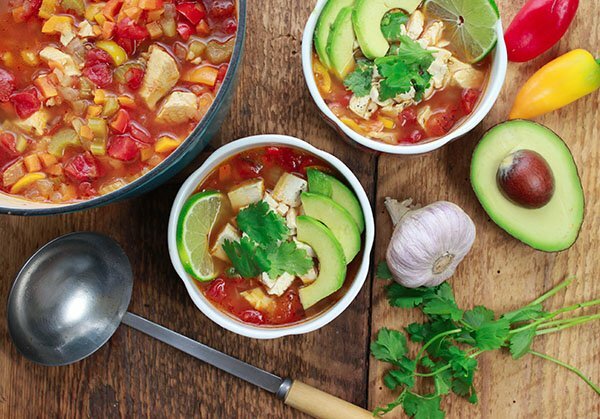 This Asian-Inspired Chicken Tortilla Soup is a flavor bomb! It’s loaded with goodness and is so low-cal! 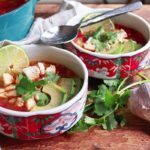 I used the freshest veggies for this healthy, Asian-Inspired Chicken Tortilla Soup soup that stay firm-tender in every bite! Make it a tortilla soup night! 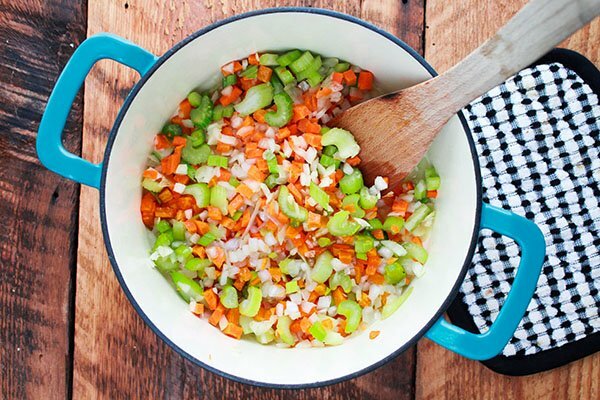 If you have little time to prep a meal, this is the go-to soup for you! Done in 30 minutes or less! This Asian-Inspired Chicken Tortilla Soup literally takes about 30 minutes from start to table! Hints of ginger, soy and sambal chili paste give this soup that Asia-meets-Mexico flavoring. Loaded with fresh veggies, simple chicken stock, and diced tomatoes, there is nothing in here that is not good for you! Heat the oil in a dutch oven or soup pot on medium-high heat. Add in the garlic and onion. Stir until fragrant, about 2 minutes. Add in the bell peppers, jalapeño peppers, carrots, celery, and ginger. Sauté for 5 minutes. Stir in the cumin and white pepper to combine. Add in the chicken broth, soy sauce, rice vinegar, tomatoes, sambal oelek, and lime juice. Stir, bring to a boil, lower to simmer and slightly cover for 15 minutes. Taste for seasoning. Add in the chicken pieces and cilantro. 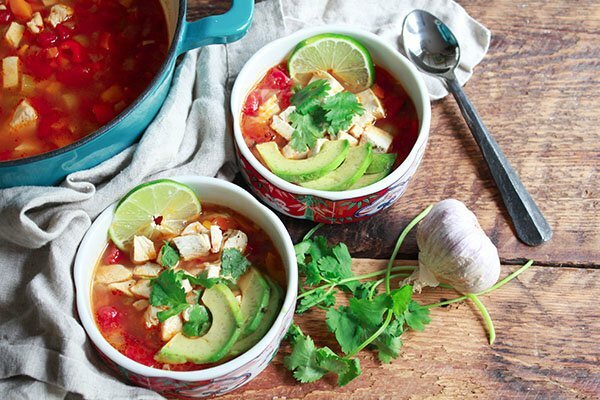 Ladle into soup bowls and garnish with sliced avocado, cilantro, and lime wedges. 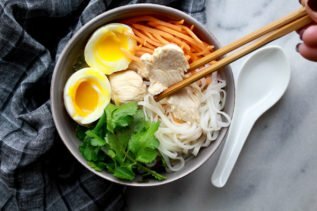 If you liked this recipe, try our Miso Chicken Noodle Soup. So much flavor in this soup! I love all the veggies in there! Tortilla soup is one of my faves because it’s so easy to make and great for all seasons. The added Asian flavorings are a bonus!